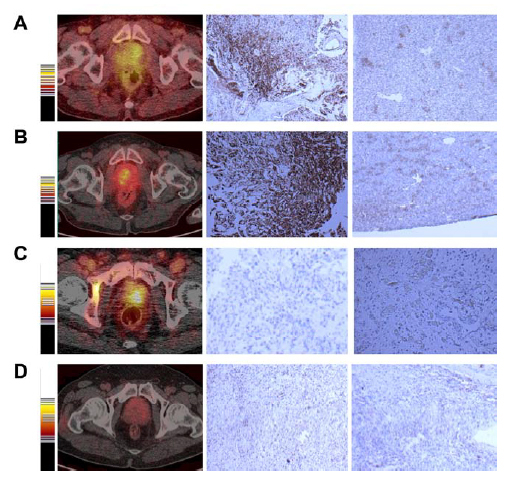 Researchers at the National Institute of Biomedical Imaging and Bioengineering (NIBIB) have developed a new radiotracer to diagnose prostate cancer and conducted a successful Phase I clinical trial, published in The Journal of Nuclear Medicine. Prostate cancer is the fifth leading cause of death worldwide and is especially difficult to diagnose. While prostate cancer is relatively easy to treat in its early stages, it is prone to metastasis and can quickly become deadly. In order to plan how aggressively they should treat the cancer, it is important for doctors to know how far the cancer has progressed. Currently, doctors use a variety of imaging techniques and tests to diagnose and monitor prostate cancer including PSA blood tests, magnetic resonance imaging (MRI), single photon emission computed tomography (SPECT), positron emission tomography (PET), and computerized tomography (CT) scans. Each method has strengths and weaknesses, but there is no single method that is able to successfully identify and monitor primary tumors, metastatic lymph nodes, and bone lesions. 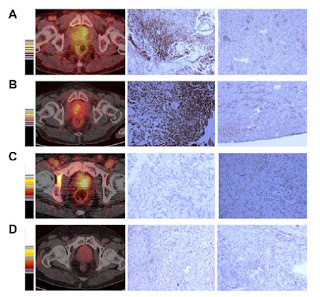 Xiaoyuan Chen, Ph.D., Chief of the Laboratory of Molecular Imaging and Nanomedicine at NIBIB, and his team attempted to solve this problem by developing a radiotracer that could identify prostate cancer at all stages. Radiotracers are made up of carrier molecules that are bonded tightly to a radioactive atom. Like a key fitting into a lock, the carrier molecules bind to certain receptors or biomarkers and the radioactive atoms enable PET or SPECT scanners to image areas where the tracers have collected in large numbers. This new tracer targets two biomarkers, gastrin-releasing peptide receptor (GRPR) and integrin αvβ3, that often indicate prostate cancer. Previous tracers have targeted GRPR but this new tracer is one of the first dual-receptor target tracers, or tracers that target more than one biomarker, to be studied in humans. The tracer was able to successfully identify 3 out of 4 primary tumors, all 14 metastatic lymph nodes and, significantly, was able to identity all 20 of the bone lesions in the patients. The current method of identifying bone lesions is to use the radiotracer MDP with a SPECT scanner. While this method is consistently able to identify bone lesions, it often comes up with false positives and is not able to identify primary tumors. This can cause the patient to undergo unnecessary treatments or painful biopsies. Chen believes that dual-receptor targeting tracers could one day be the primary method for diagnosing and monitoring prostate cancer reducing the amount of medical scans a patient would be forced to undergo and streamlining the diagnostic and therapeutic process.